Yet despite its success, I can’t help but find Out of Time one of the band’s weaker efforts, competing with Murmur as their most overrated. It might seem sacrilegious to say that about an album that contains such classic songs as ‘Losing My Religion,’ ‘Half a World Away’ and today’s SOTD. But Out of Time is also responsible for the awkward rap experiment ‘Radio Song,’ ‘Shiny Happy People’ and instrumental filler ‘Endgame.’ ‘Low’ and ‘Belong’ are fine but repetitive. ‘Texarkana’ and ‘Me In Honey’ are good songs but nothing I find myself returning to very often. ‘Near Wild Heaven,’ featuring a rare Mike Mills lead vocal, is my favorite song on the album apart from the first three I mentioned, and that’s a somewhat disposable Beach Boys homage. 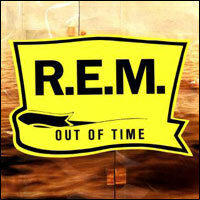 Out of Time is most notable for expanding R.E.M.’s sound… not just the inclusion of the mandolin (something they’d tried already on Green) but through more expansive production, guest vocalists and an overall brighter, cleaner sound than we were used to hearing from the band. Most of these middle R.E.M. albums pinpoint me to a time and place and Out of Time is no exception. In this case it’s my freshman year at the University of Florida. I bought the album, as I did so many others, at an independent record shop within walking distance from my dorm. I took that walk countless times that year and spent pretty much all of my disposable income on music. My favorite song on this album is probably ‘Half a World Away,’ one of the band’s finest, most transcendent moments on record. But I’m featuring ‘Country Feedback,’ a close second, today because it’s a great example of the angst-y dark side of R.E.M. and a wonderful example of how music conjured up by Buck, Mills and Berry inspires complementary lyrics and vocals by Stipe. This entry was posted in song of the day and tagged Country Feedback, Out of Time, r.e.m.. While I agree with your overall opinion that this is not one of their very best albums, I find that ironic when I’m simultaneously shaking my head in disbelief that you chose not to feature three of the songs (“Low,” “Near Wild Heaven,” and “Half a World Away”) I love best. So… I guess it’s all relative. Any album that contains several songs you appreciate as much as I do those, plus today’s haunting SOTD, plus the undisputed (and really odd!) hit “Losing My Religion” is a pretty spectacular near miss. While I agree that some songs from this album, like “Shiny Happy People,” overstayed their welcome through excessive radio play, I would not call this a lesser album from REM. I can see the argument that the rap on “Radio Song” feels awkward, but I still like the song. I also like the instrumental “Endgame.” And when you watch the clip Amy posted of “Losing my Religion” performed live, how can you really question the song being a hit? It is an unabashed pop song skewed just enough with the mandolin and Stipe’s lyrics and delivery to make it infinitely fresh and listenable all these years later. For me, though, the standout on this album, and the one I would have picked for the SOTD (that is unless I chose to break my mother’s heart as you did:)) is “Half a World Away.” That song possesses everything I love about REM — the pop sensibility tempered with lush instrumentation and Stipe’s great lyrical interpretation. Oh, and thank you Amy for sharing that Brand clip–he really is hilarious! Thank you so much for playing my song Clay!!!!! Just kidding. It is an interesting choice, but I’m still bouncing up and down listening to the live performance Amy posted. Thanks for that and for that hysterical Brand clip! And thank you Clay for exposing me to all that they have done besides “Losing My Religion”! Strange how perceptions can be so different. I think “Shiny Happy People” and “Radio Song are wonderful, even if they’re a bit silly. Then there’s that bassline in Texarkana, the pop glory of “Near Wild Heaven” and of course the songs you mentioned. Opinions are opions of course, but the comment I was shaking my head at the most was when you called “Low” ‘repetetive’. The way the music rises and falls, the way Michael’s voice builds, the lyrics… everything about it really. One of their finest moments.